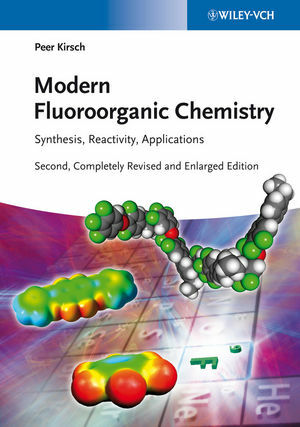 The second edition of this classic reference work has been completely revised and updated, as well as being enlarged by 20% to reflect the latest developments in synthetic organic fluorine chemistry, taking into account new applications in materials science and medicinal chemistry. The new developments in transition-metal-catalyzed methods for the introduction of fluorine and fluorinated groups are discussed. In addition, new chapters have been added on such important applications as organic electronics (OLEDs) and fluorinated dyes. Appendices containing synthetic procedures and conversions round off this comprehensive work. This work is a valuable reference for fluorine chemists that also provides nonspecialists with an introduction to the field. Peer Kirsch is the Director of Emerging Technologies at Merck KGaA in Darmstadt, Germany. Having obtained his PhD in chemistry at Heidelberg University and the Max Planck Institute for Medical Research working with Prof. Dr. Heinz A. Staab in 1993, he spent two years as a postdoctoral researcher at the Institute of Physical and Chemical Research (RIKEN) in Wako, Japan, before he joined Merck in 1995. He worked on the design and synthesis of liquid crystals for LCD applications for 10 years, with a strong focus on fluoroorganic synthesis and computational property prediction. From 2005 to 2010 he worked for Merck Ltd. Japan in various functions. Since 2009 Peer Kirsch is a visiting professor at the University of Bremen and he teaches also at the University of Freiburg since 2011. He has authored more than 45 scientific publications as well as more than 140 patents. His main research interests include the application of fluoroorganic chemistry, molecular modelling and combinatorial methods for the design and synthesis of highly fluorinated liquid crystals and other advanced materials. "... a well-produced book with attractive graphics, photos and schemes. Throughout the book, coloured electrostatic maps of small organofluorine compounds are used to illustrate charge distributions. These are effective as well as attractive. I would point any organic chemist to this book who wants to learn about and do some fluorine chemistry. It provides uncluttered descriptions and a clear orientation to the literature in this important area of the organic chemistry."